Greaf explained the benefits of text-to-give and text-to-donate include the speed and conveniences, while negatives include contribution limits, time it takes to receive the money, and security concerns. She highlighted notable text-to-give and text-to-donate campaigns such as the 2010 Haiti charitable event, Keep a Child Alive, and the NFL and United Way events. Greaf proposed that campaigns should be required not to use the text-to-give, but to use the text-to-donate. She also proposed that at a specific contribution levels, liability should be on the individual contributor and not the political committee. 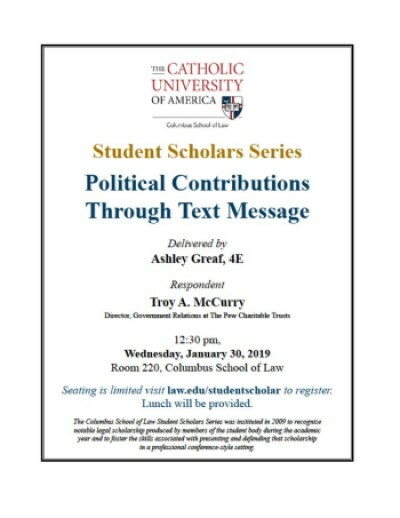 Greaf, Ashley, "Political Contributions Through Text Message" (2019). Student Scholar Series. 30.